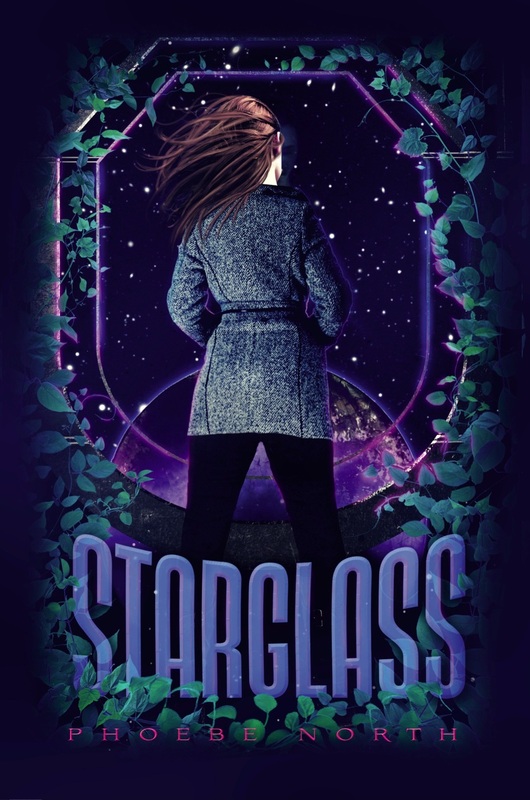 Today we are thrilled to host a stop on Phoebe North’s blog tour celebrating the release of Starbreak, the second book in her Starglass sequence. Thea was a fan of Starglass, the eponymous first book in the series, so we are delighted to have Phoebe talk today about the worldbuilding in her writing. Please give a warm welcome to Phoebe, everyone! I didn’t intend to write a Jewish YA sci-fi novel. In fact, there were years when I was reluctant to even call myself Jewish. With a gentile father, I was a halfsie. With a nebulous belief in a higher power, I was an AgnostiJew. Sure, my speech might have been peppered with Yiddish, and I went on a Birthright trip to Israel in my mid-twenties but I’d never belonged to a temple or had a Bat Mitzvah. Really, I was more Jew-ish than truly Jewish. My early trunked novels all featured similarly Jew-ish protagonists, but their cultural identities were as incidental to their characters as I felt my own Jewish identity was to mine. This was initially true for Starglass, too. Though I’d named grumpy protagonist Terra Fineberg, after my mother’s family, she wasn’t a particularly Jewish girl in those early drafts. In truth, I fully expected to change that last name to something a little cleaner, cooler, and more typically YA. In short, I expected to make her generically Anglicized. Which was another way of saying I was going to make her seem Christian. My book’s worldbuilding was similarly generic at first. But I’m a lucky writer in that I’ve had some excellent beta readers who were disappointed to see blandly futuristic slang and cultural elements in what they felt was an otherwise compelling book. One day, I found myself reflecting on Terra’s name, and on the isolated society of the Asherah, the spaceship where she lived. In fleeing a dying Earth, the ship’s inhabitants were nothing if not a society in diaspora. I thought about how my own religious identity had become diluted and muddled by time—how I love both Christmas trees and the seder plate, how I can recite prayers by rote by otherwise can’t speak a lick of Hebrew. I thought of my experiences in Israel, on an intense and sleep-deprived two-week trip. My grandparents had supported Israel in any way they could, of course, like most American Jews of their generation. But they never considered moving there. Their roots were elsewhere—in the Orthodox synagogue in the mostly-black town in New Jersey where the men sat on one side and the women on the other, around my grandmother’s table at the holidays. Their parents had escaped conscription in Russia. They’d faced the Depression and a World War themselves. They were American, truly. But they remained Jews. And so did their children and grandchildren, even as they married gentiles and raised them in mixed households. I decided the people of the Asherah would reflect that uniquely diasporan, uniquely American Judaism, with every individual representing a unique flavor of belief and cultural identity. Terra is less spiritual than I was as a teenager, though, like me, she grew up immersed in Jewish practices she didn’t always understand. But her friends and family members come to navigate their own identities differently, particularly as the events of Starbreak unravel. And the citizens of the Asherah are confronting a future where Zionism seems impossible—a world where Israel would have likely been destroyed, along with the rest of the Earth. Yet the Rachel of Starbreak begins to believe in the promise of Israel. Perhaps that might seem like madness; it certainly does to Terra. But one of the hallmarks of true faith is that those on the outside often misunderstand. I didn’t want to provide any clear answers to the religious questions raised in Starglass. This isn’t a cautionary tale of religious extremists (there are enough of those stories out there already, if you ask me; that story has been amply told in literature for both children and adults). Rather, it’s the story of a girl and her identity—religious, sexual, and vocational. And I wanted to ensure that the world behind her was complicated, just like our world, that it bore the mark of a myriad of influences, political, spiritual, and cultural. A mish mosh, as my grandmother would say. Ironically, through the writing and publication of Starglass I found my own interest in Judaism renewed. Sure, I remain an agnostic humanist. Yes, we still have a Christmas tree. But I’m no longer embarrassed to admit that I find great comfort in lighting the Shabbos candles, in saying the motzi—in calling myself Jewish. Yes, I have a goyish name, nose, and freckles. But like Terra, I know where I came from. I look back, even as I look ahead. 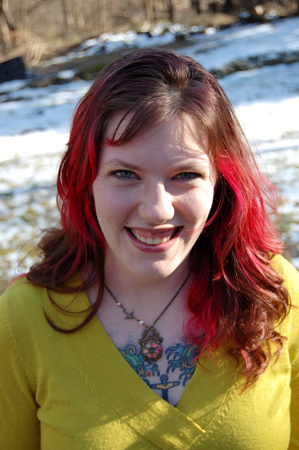 Phoebe North has an MFA in poetry from the University of Florida. She lives in New York State with her husband and her cat. Her first novel, Starglass, is forthcoming from Simon & Schuster Books for Young Readers in July of 2013. Find out more about Phoebe on her website, by following her on facebook, twitter (@phoebenorth) and goodreads. We’ve got a signed, hardbound copy of both Starglass and Starbreak up for grabs! The sweepstakes is open to ALL and will run until Friday July 4 at 12:01am (EST). To enter for a chance to win, use the form below! Good luck! If I were leaving a dying earth, I would take my all time favorite books (2 or 3) and pictures of my extended family as a group and probably some baby pictures of my children. The picture thing is hard. A few of the most iconic family pictures including some baby ones probably sums it up best. If I was leaving a dying earth, i would take books, lots and lots, so our history and literature would not be lost. Books and music. As much as possible of both. A truly eclectic collection. This is presuming I don;t have to sweat the survival type supplies, and that friends and family are coming along. Unlimited amounts of people. Because if you started narrowing down the people, then it gets too dicey to answer (and I don’t think I’d be included anyway.) Ever read Annabel and Edgar Johnson’s “An Alien Music”? Addresses these questions and a great story. Has stuck with me through many years. As many books as I could pack and my kindle for when I run out of room.Plus tons of pictures,and Pepsi! Talk about bad timing reading this article, I literally just came from reading about some of the horrific Palestine-Israel conflicts happening right now, to this pro-Zionism piece, and it left me a little sick to my stomach. Maybe for Terra and the citizens of Asherah there can be a Zion utopia on a new world, but hopefully one that doesn’t involve displacement and apartheid of its native peoples. Like everybody I would take a lot of books !!! !And pictures !! But mostly I would bring my cat (even tough she is not and object !!). Bell, my own feelings about Zionism are complex. Acknowledging the importance of Zion in the minds of many Jews isn’t the same thing as advocating for apartheid (or even agreeing with those sentiments). I really enjoyed Starglass because of the Judaism — it created what felt like a reasonable world of secular/background/casual Judaism, where major things are based off of Judaism, but people act as if they are secular (historically and also currently), which was not dissimilar to the way Christianity works in many countries currently. It’s slightly different because of the deliberateness of it, but it was a much less generic-feeling spaceship. I’m even keener to read this now. I love the background. I would take my beloved and the Internet. Perhaps also knitting supplies- it gets cold in space! If you were leaving a dying Earth, what would YOU take with you? What kind of tonnage do I have access to? If it’s only a few ounces, I think it would be the watercolor my grandmother painted in 1926. It’s a fairly standard pastoral scene, very upstate New York-ish, but warm and pretty. And I’d want the memories of both the scene being lost and the people, too. If it’s only a few pounds, I’d be stuck trying to choose books at random. Electronic books are wonderful, but I’d want some things in a physical form – both horribly more vulnerable, but off the net, all the same. At least one of those books would be something by Solzhenistsyn. Either One Day in the Life or The Gulag Archipelago. I’d be tempted to dig out a copy of Last Letters From Stalingrad, too. As a bit of a mish-mash myself, I find this idea fascinating in the extreme. I missed Starglass when it first came out, but I will be correcting that soon – and looking for Starbreak as soon as I may. My family first, then books! Oh I remember seeing the review of Starglass and it sounded interesting, I’m in! Beyond basic survival supplies, I would take as much nonfiction as possible to remember; fiction, art and music to enjoy, as many varieties of animals and plants as possible, and all of my family and friends. What a great guest post! I can’t recall reading many books highlighting Jewish culture, so I’m definitely interested in reading North’s series. Thanks for the giveaway! I would want to take people with me, if possible, and my dog. If I were leaving a dying earth my first concern would be family. Assuming that they already have passage and are not carry on items? Identification and photographs. Past that maybe a couple books and my guitar. It depends on the limits. I would take my family, pictures, books, and anything I thought I would need that I could carry. A survival kit. Who knows what I would find! !